Believe it or not but fall is right around the corner! I know saying that just about killed me but it's true, fall is coming faster than you think and want! Thinking about fall and looking at my summer bag has made me realize that I need a new fall work bag. It’s unbelievable what you would find in my work purse-more lip products than one can use, jewelry, socks (I’m not the only one that has socks right? ), mending kit, water bottles, papers, crackers, etc. I seriously carry more than a person should in a purse and it’s no wonder I have back pain! I just never want to be somewhere and not have what I need. I usually spend a little extra and invest in a sturdy purse that will last being used day after day. I don’t want to buy something cheap and have it fall apart two weeks after buying it because let’s be honest- who isn’t rough with their purse? Keeping all of this in mind I’ve found a few bags that would fit everything but yet still keep me looking chic all under $150…one my one dream splurge bag. Which work bag is your favorite? Gorgeous!! That BCBG and ASOS options are perfection. 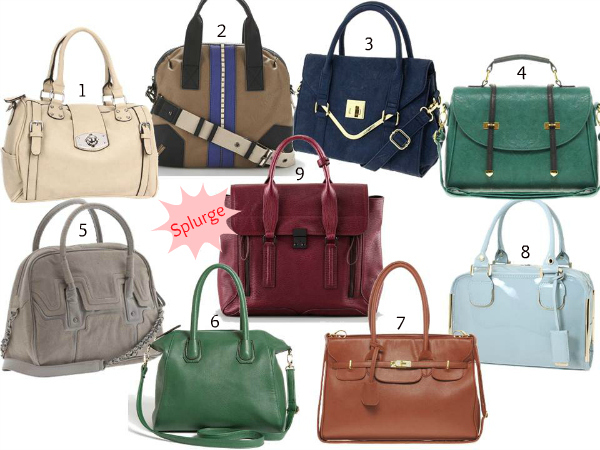 #7 Looks just like a very expensive Prada bag! By far my fave. Love your blog and I am now following on gfc! I love all these bags! What a great selection. My favorite would have to be the KDNY one. What a beauty!